I first met the Shipyard Girls some four books previous to this one, back last year. I stumbled across the second book, had to read the first and I have been hooked ever since. So when I got the opportunity to read this one, I was not going to let it pass me by. It is now 1942 – the war is still raging on and the Shipyard Girls are doing their best to keep up their own spirits as they work long, tough hours in one of the many shipyards in Sunderland. Rosie is still in charge of the women welders and she tries to keep herself busy as whilst life has changed for her in some ways, especially with her strong relationship with Peter. Her old life is still playing a part and it is something that she cannot give up, despite the risks. Gloria, despite having recovered from her ordeal, is still holding onto some secrets, not her own – but others and she knows that if she does anything those around her will get hurt. Bel is put out that her mother Pearl seems to have a stronger bond with Maisie, than her and she is determined to find out her true parentage. Pearl has other ideas. In a change we are taken through flashbacks to Pearl’s earlier life and see what has happened to her which may indicate her behaviour in the present. Helen is still blazing a trail being in charge at the shipyard whilst her father has had to go to Scotland – his absence is being felt keenly by Helen even though his actions have hurt her deeply. When she discovers the truth about what real love is like, she turns to unexpected quarters for help. As with any saga if you follow it from the beginning, the characters are either in the background, still there and well rounded, or they are in the forefront of the plot and we learn more about them whether it be their past or the actions they take in the present. 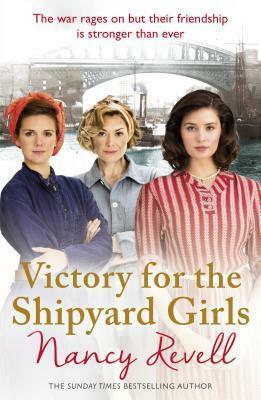 Victory for the Shipyard Girls is out on 6 September. As the sixth book is still set around 1942 – I am hoping that there are many more books to come!